HomeAnalysisVaccines: Is HHS Engaged in “Heavenly Deceit”? After reading the recent statement prepared by Informed Consent Action Network (ICAN) to the acting director and secretary of the US Department of Health and Human Services (HHS), I was struck by the similarities between HHS, the CDC, its most faithful proponents, and the infamous religious cult. Each in their own way is practicing deceit to increase their following. For example, HHS’s letter begins with the claim – “Many pediatric vaccines have been investigated in clinical trials that included a placebo.” Unfortunately, HHS’s assertion is simply untrue. Using HHS’s own documentation, ICAN was able to establish that only 1 out of 30 vaccine brands routinely injected into American children today was licensed based on a clinical trial which included a placebo-control group. The reason this is significant is because it is impossible to know if a medical product is safe without testing it against an inert/saline placebo. Another example of deceit is the claim made repeatedly by both HHS and the CDC that “vaccines do not cause autism.” HHS and the CDC offer this statement as a scientific fact (“the science is settled”) even though there are no published studies substantiating this claim for the Hepatitis B, Rotavirus, Hib, Pneumococcal, Polio, Influenza, Varicella, or Hepatitis A vaccines – each of which HHS’s vaccine schedule recommends babies receive by six months of age. The only vaccine HHS has studied with regard to a vaccine-autism link is MMR. However, Senior CDC Scientist Dr. William Thompson, under whistleblower protection, provided a statement through his attorney that HHS “omitted statistically significant information” which shows an association between the MMR vaccine and autism. Based on all available data, there is no integrity to HHS’s claim that vaccines have been exhaustively studied and proven to cause less permanent injury than the diseases they target; nor the declaration that vaccines do not cause autism. 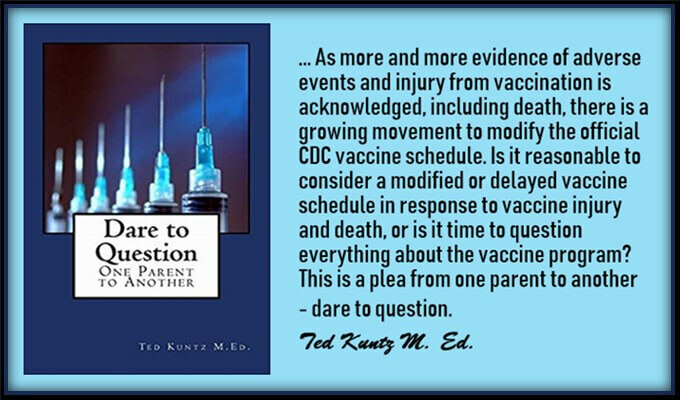 HHS and the CDC, to this day, persist in making fraudulent and scientifically unsubstantiated claims in their effort to coerce the public into vaccine compliance. Data proves that the studies used to support immunization are so flawed that it is impossible to say if immunization provides a net benefit to anyone or to society in general. The effort to deceive the public is also evident in the testimonies of notable vaccine proponents. Dr. Stanley Plotkin, considered “the godfather” of vaccination due to his involvement in the development of numerous vaccines, reveals his willingness to deceive the public in a videotaped deposition. It is increasingly apparent that Health and Human Services, the Centers for Disease Control, leading vaccine proponents, and a captured and compliant mainstream media are intentionally engaged in deception. Another way to state this is that their claims of vaccine safety are fraudulent. A con. A scam. A ruse. We are being lied to, manipulated, and tricked into participating in a medical practice by an industry that is free of liability for the harm caused by their products. These institutions and their supporters are actively engaged in undermining our right to informed consent, therapeutic choice, and self-determination. It matters not whether these individuals truly believe in their purpose. What matters is that they are making statements they know to be false. The medical authorities keep lying. Vaccination has been a disaster on the immune system. 100 years from now we will know that the biggest crime against humanity was vaccines.